US 4Q GDP was revised down to 2.2% and 1Q19 growth is likely to be even lower. This will fuel talk of Fed rate cuts, but we still think there are reasons for optimism. 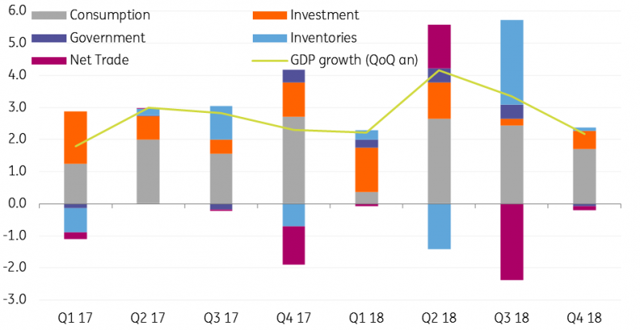 4Q US GDP has been revised down to 2.2% QoQ annualised from the 2.6% figure initially reported. This is the weakest reading since 1Q18 and in the febrile world of markets it will do little to dispel talk of an intensifying US economic slowdown. Yet we have to remember that this still equates to growth of 3%YoY, something that virtually any other developed market would desperately love to have. The details show consumer spending growth now at 2.5% versus 2.8% originally while non-residential investment was revised to 5.4% from 6.2% and residential investment is now -4.7% versus the -3.5% figure initially reported. Government spending was revised to -0.4% from +0.4%, but the contribution to growth from net trade was revised up to -0.08 percentage points from -0.22 percentage points. Inventories were largely left unchanged. 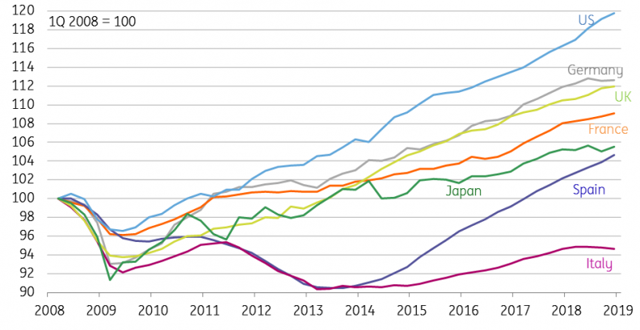 Taking a step back it is clear that the US economy continues to perform very well both in absolute terms and relative to key developed market economies. Output is now 20% above its 2008 pre-crisis peak with the economy having grown 24% since its 2009 trough, whereas the UK and Germany are eight percentage points behind and Italy is in a completely different race. It is remarkable that a country that was the primary source of the financial crisis was in the end the least impacted and has performed the best - amongst key developed markets - since. We suggest this is down to a swift recapitalisation of the banking sector, an early and aggressive response from the Federal Reserve (whereas the ECB actually raised rates in 2011) and a fiscal policy response as far removed from Europe's position as you can possibly imagine. The Atlanta Fed GDPNow indicator is frequently cited as an important gauge of how the economy is performing at a specific point in time. However, it is important to remember it is simply a "Nowcast" for a quarterly GDP figure based on the numbers already released - it is not an actual forecast. It had been running below 0.5% annualised growth through the first half of March, but after yesterday's trade figures it is up to 1.5%. We continue to look for a 1Q GDP growth outturn of 1.5-2%, which we believe would be very respectable given the government shutdown for much of January and late December and the tendency in recent years for 1Q GDP to disappoint. We think 2Q GDP will be better given the firm labour market and rising pay and if we can see progress being made in US-China and US-EU trade talks this would remove a dark cloud that hangs over the global economy. Moreover, there are tentative signs that China's stimulus programme may be getting a little bit of traction and the rise in the German Ifo index may also be a positive signal. But in the wake of softer global activity data and the Federal Reserve's dovish shift, financial markets are increasingly of the view that the next policy move will be an interest rate cut. Futures markets are now pricing in around 30bp pf interest rate cuts this year. Our view is that policy will remain on hold this year and that is down to the underlying resilience of the US economy.